Do you know? Which dressage stallion has the most offspring in sport? In all disciplines of equestrian sport and at all levels you will find KWPN horses in the competition arena. In the article about the Gelder stallion Parcival, which could be read in the Dutch KWPN magazine, it was clear that almost 18 percent of his offspring competes at Z1-level or higher. This made us curious how this compares to the dressage stallions. Which stallions have the most offspring at Z1 dressage level or higher? In total there are 552 KWPN approved stallions with KWPN-registered offspring competing at Z1-dressage or higher. More than 12,000 KWPN’s have a sports score of Z1 or higher. With 666 offspring, dressage horse progenitor pur sang Jazz takes the lead. Followed by Gribaldi with 477 offspring and Flemmingh with 378. However, these three gentlemen also have a large number of KWPN-registered offspring, making it more logical that they have more offspring in the sport. If we put the number of offspring at Z1-dressage or higher against the number of KWPN-registered offspring of a stallion, this gives a clearer picture. Instead of Jazz, Sir Sinclair now takes the lead: 21.9% of his offspring are at Z1-dressage or higher. In second place we find Cocktail with 21.4% and Jazz takes third together with Ziësto with 21.2%. With 104 KWPN-registered offspring and 22 offspring at Z1 and higher, Ziësto has very different numbers than Jazz, but in percentage they are equal. With 18.3% follows El Corona, followed by Welt Hit II with 18.1%, Painted Black with 18%, Krack C with 17.5%, Olivi with 17.4% and Cabochon with 17.2%. As soon as a horse is six, it may compete in the Z1 class. It is not surprising that we see 'older', proven stallions in the top 10. The young sires have relatively many young offspring. A horse that is now six, was born in 2012. Therefore, stallions that were approved in 2011 for breeding are the youngest stallions with Z-dressage offspring. These are Desperado (1), Don Tango B (2), Diëgo (1), Dream Boy (3) and Connaisseur (3), all approved in 2011. The C-year is a year older and some of these stallions have a few more offspring at Z1 or higher: Charmingmood (1), Cadans M (1), Cachet L (1), Carlton Hill VDL (2) , Chagall D & R (4), Chippendale (7) and Charmeur (32). Also two jumping stallions from the C-year have offspring at Z1 level or higher: Crespo VDL and California. Charmeur stands with 32 offspring far out from the rest but with almost 1,300 offspring he also has the most offspring of this group of young stallions. 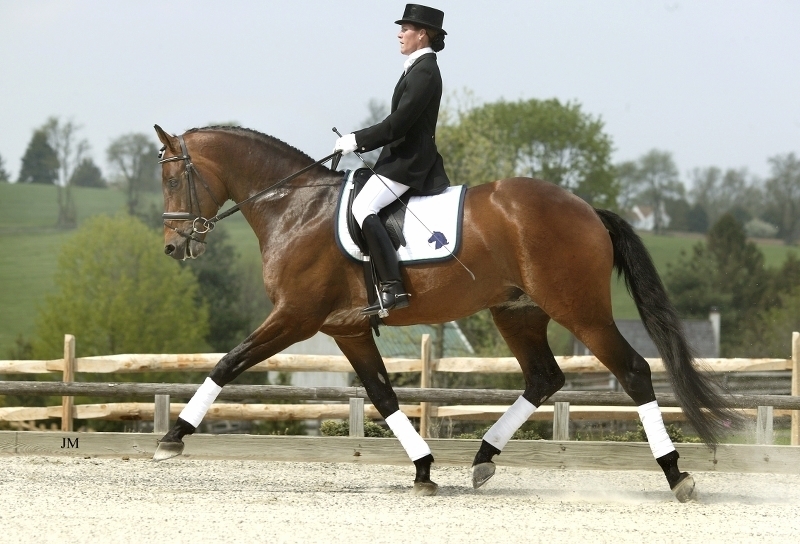 Connaisseur scores best when the number of offspring at Z1 dressage or higher is set against the total number of KWPN registered offspring. Three offspring from 100 show at Z1 or higher (3%). He is followed by Chagall D & R (4) with 2.9% and Charmeur 2.5%. If we look at the highest level, the Grand Prix, then Jazz is in the lead with 131 Grand Prix offspring. Set against his total number of KWPN offspring this is 4.2% and also the highest of all dressage stallions. He is followed by Contango (24 GP horses, 3.8%), Painted Black (21 GP horses, 3.6%), El Corona (10 GP horses, 3.5%), Welt Hit II (21 GP horses, 3.2%), Aktion (11 GP horses, 2.9%), Gribaldi (82 GP horses, 2.7%), Krack C (39 GP horses, 2.5%), Cocktail ( 10 GP horses, 2.5%) and Chronos (13 GP horses, 2.5%).